A huge congratulations to all or students completing their RAID Open Water 20 dive course today at Mathesons Bay. A big thanks to Martin for divemastering and helping the dives run smoothly. The team finishing their qualifying dives at Mathesons Bay. The weather forecast was grim with 30 knot winds and 1.5m swells brewing, however, Mathesons Bay was sheltered from the westerlies and turned on calm seas and great visability. An eagle ray even turned up to make our day. Topped off with an ice cream stop at Charlies, in Matakana, it was an awesome day out ! 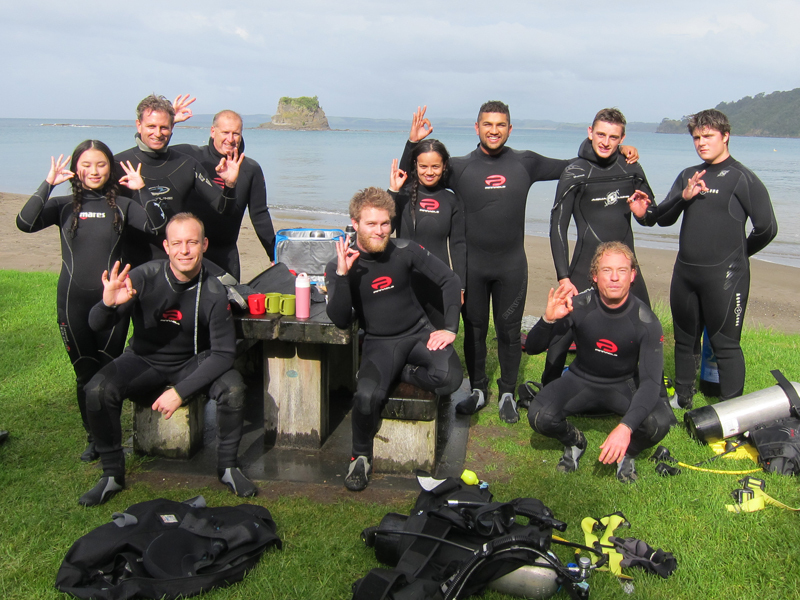 This entry was posted in Courses and tagged Learn to Dive, Mathessons Bay, RAID Open Water 20. Bookmark the permalink.